GREAT MILES 24,787! 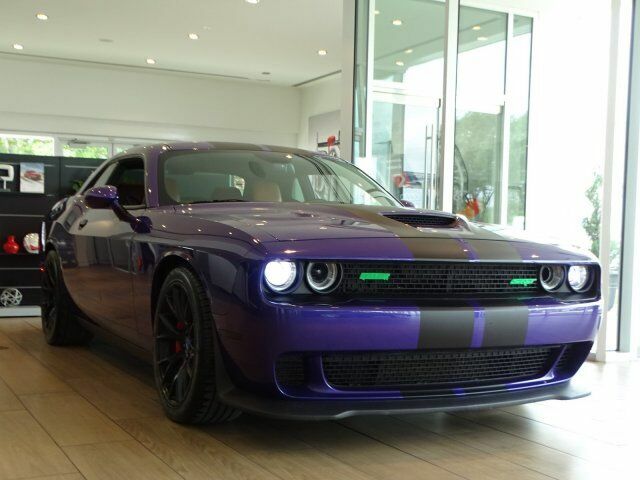 SRT Hellcat trim, Plum Crazy Pearl Coat exterior. PRICED TO MOVE $900 below NADA Retail! Heated Leather Seats, Nav System, Aluminum Wheels, TRANSMISSION: 6-SPEED MANUAL TREMEC, ENGINE: 6.2L V8 SUPERCHARGED CLICK NOW! Leather Seats, Navigation, Heated Driver Seat. ENGINE: 6.2L V8 SUPERCHARGED (STD), TRANSMISSION: 6-SPEED MANUAL TREMEC (STD). Rear Spoiler, MP3 Player, Onboard Communications System, Aluminum Wheels, Keyless Entry, Steering Wheel Controls, Heated Mirrors. Edmunds.com's review says ". interior space is where it utterly puts to shame its Ford and Chevy rivals. The backseat is remarkably roomy for two adults, with good headroom and decent legroom. By comparison, the Mustang and Camaro are really for small children only.". This Challenger is priced $900 below NADA Retail. Pricing analysis performed on 4/14/2019. Please confirm the accuracy of the included equipment by calling us prior to purchase.